The 70's are regarded as one of the most interesting decades on popular music history, mainly due to its amazing amount of different sounds; the 70's saw the splendor of hard rock, funk, progressive rock, jazz fusion, etc... All of these genres had bands that managed to create classic albums, however it is pretty weird to find a band that could fit on pretty much every category and there's when we start to notice Banquet by Lucifer's Friend. Lucifer's Friend is a german rock band founded in Hamburg in 1970, during their first three albums they showed an extremly varied style, taking influences from prog, to hard rock to jazz or even funk, however this mix of sounds resulted in rather inconsistent albums that proved the amount of talent these guys had but with some severe problems: these releases just didn't flow pretty well, sure the mix of styles was an excellent idea but it just wasn't implemented in a good way. This was fixed in 1974's Banquet, here the band finally found the sound they were looking for on earlier LP's. The different tempos, the variants in the atmosphere, everything is done in a smooth way so the album flows just like it is supposed to. The best example of this is the opener Spanish Galleon which is also the best song in the album, Lawton's powerful vocals, the energetic horns, the fast guitar, the catchy chorus in the end or the excellent synth solo that closes the song, every moment manages to be just perfect. Most bands that tried to mix many different styles just took the genres and threw them in a bag creating a big mess, here it is totally different, Lucifer's Friend gently takes every popular genre at the time and carefully placed it in a polished way. The drinks, the dessert, every aspect of this Banquet is arranged in an excellent way so you can have the best meal ever. Wether it is the upbeat vocals and powerful hard rock atmosphere you can find on High Flying Lady - Goodbye or the calmed and proggy energy on Sorrow that leans more towards the ambiental side of the musical spectrum, the truth is that every member of the band manages to shine at every moment. Lawton's voice is probably the best aspect of the group: Powerful when needed and full of feelings when it is supposed to but always, always catchy as hell. He show us why he is, by far, one of the most underappreciated rock singers of the 70's. But he's not the only one with tons of talent to display, Bornhold's fast drumming, Hecht's bluesy piano or Hesslein's skills on the guitar are all excellent, accompanied by excellent orchestral instrumentation, Banquet is just a feast of good taste. But why is it that we don't see a classic in Banquet" the answer is pretty interesting and very ironic actually: It is true that every member of the band is extremly talented, it is true they managed to create one of the very few albums that mixed totally different styles in a good way and it is also true that the LP shines on every aspect wether is the catchy or the ethereal moments, but it is in all of this where it lies the album's only real flaw: Those that listen to it looking for some good ol' rock n' roll will love moments like the catchiness of High Flying Lady - Goodbye or the mad guitar solo in Thus Spoke Oberon but will found songs like Sorrow rather boring at times thanks to its jazzy/proggy atmosphere. The opposite will happen to those that listen to this looking for serious prog-rock or jazz fusion, awesome at times but just to cheesy at others. You can't really blame the band for this flaw though, it is pretty much inevitable when you do a fusion of totally different stuff that not everyone will enjoy it; they, however, did it in an almost perfect way so this aspect is almost unnoticeable specially for those that in the first place love all of the genres here presented on their own and that might find in here a stone cold classic. Banquet is certainly an underrated gem in music, fresh, original and with tons of fun, it is a record that just doesn't get the attention it deserves and it is a must for every 70's fan. 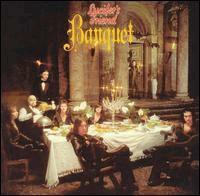 The band would never reach the awesomeness of Banquet ever again, different vocalists, different band names... Lucifer's Friend would later become the mess that Banquet wasn't. War (USA) The World Is a Ghetto Supertramp Crisis? What Crisis? As always I'd appreciate if you guys could tell me if there's any typo in here since english isn't my first language. YES! Was counting on you for this one, Gentleman ;) Good job. I can't remember a single note off this album. Will check later. Good review. To my eyes, it doesn't really show that English is not your mother tongue. Ive never heard this. Im get on it right now. Sweet review. Yes the chorus is catchy as hell. I now recognize it. Love the brass section too. And that guitar solo a la Santana...Everything is perfect about this song. "these releases just didn't flowed pretty well, sure the mix of styles was an excellent idea but it just wasn't implemented in a good way." Album is reminiscent of Jesus Christ Superstar imo at some point, not necessarily in the execution, but mainly for the similar enthusiasm of both formations. Ya right... Banquet is a contender for a 4.5 I can see. It instantly brings the good mood. It doesn't last too long after all. Album is so uplifting, you should not count that little passage like a rejection! So glad this now has a review! Pos'd. Excellent album. It's a blast to listen to the band's progression from their debut up to this album, and hear how they gradually shift their focus from hard rock to the more prog-fusion sound found here.